Out with the old, in with the bacon. 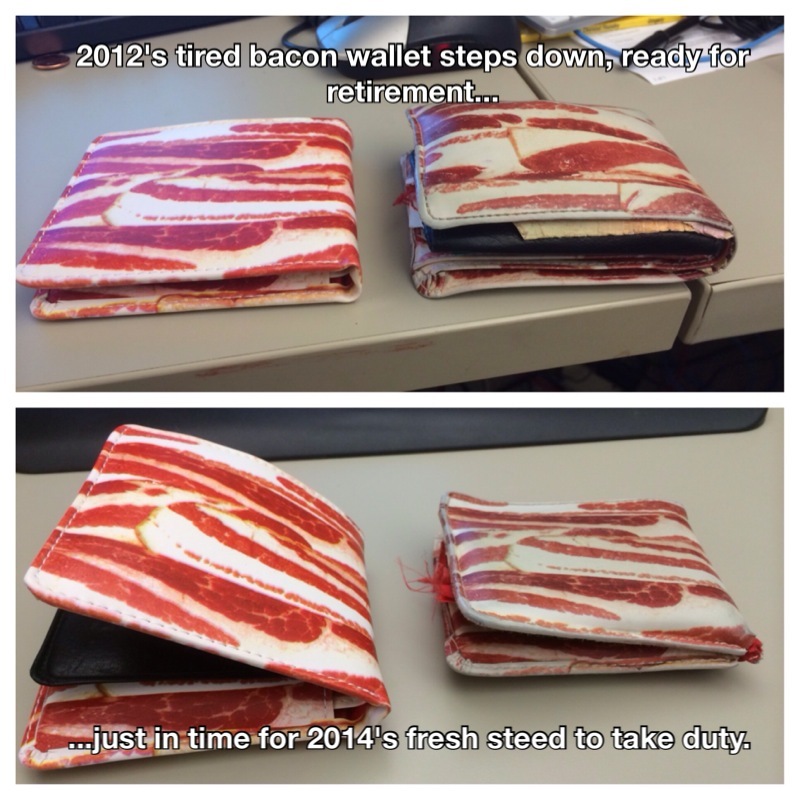 It’s that time again, the biennial replacement of the bacon wallet. I love these things but for some reason, they seem to wear out. Now, I’ve heard all sorts of different crazy theories like “you have too many things in your wallet” to “maybe it’s because your wallet is too full” and even “seriously, you should clean that out”… they’re all over the place! So as you can tell, nobody really knows why but they all seem to think it’s weird. See, I think that replacing a wallet once every couple years is a perfectly cromulent thing to do. Things get used, they need to eventually be replaced, right? I mean, we don’t all have the same toothbrush we did when we were kids, right? Of course not, because we use them and they get worn out and eventually we get another one from the toothbrush store or wherever it is you get them. “But Ben”, you may say as some sort of hypothetical straw-man, “there are plenty of things in life that should last you a while. Maybe if you cleaned out you-” Shut up! This isn’t the time or the place for wild conspiracy theories. Plus, I have plenty of things that last a long time. For example, I’ve not replaced the blade in my Gillette Fusion razor since 2008 and it works just as well today as it did in 2010. Every morning, I admire the distinguished patina of protective corrosion on it before scraping it across my neck to manage what would otherwise become an unruly IT neckbeard and it works just fine. People who replace these before they age properly have no connection to their past, no sense of continuity in their lives. Some things, you see, are meant to last and I’m just saying that maybe wallets _aren’t_ that thing. So this morning, I made a successful transplant from old to new. 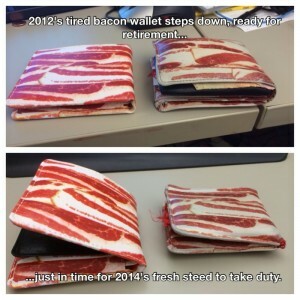 Looking into the new bacon wallet, I’m comforted by all the things I expect to see. Egyptian currency from six years ago, a Vons card from when I lived in Los Angeles (because I would feel pretty silly if I was in LA _without_ it), and my emergency Canadian penny. I heard a rumor that Canada has ceased production of their penny so by the sacred laws of supply and demand, if I hold onto this long enough I should be able to ride this baby into a plush retirement. One thing of note, the new wallet kinda creaks a little when I squish it down. As you can see from the picture, it’s a little misshapen which I assume is just a quirk of the material or something. This has happened before so I’m not that worried; I find that cramming it into my pocket long enough seems to beat the resistance out of it after a while and it eventually accepts its lot in life, like a pony that’s been broken to saddle. Onwards to the future, new wallet! And old wallet: it’s time for you to rest. Into the drawer with the rest of your kin, the stable has one more retired beast to while away the days. Your hard work over the years (both of them) is appreciated, but it’s time for a new generation to have its chance.